Beta graphs of the U.S. Environmental Protection Agency show a sharp increase in air radiation levels across the country according to a new EnviroReporter.com radiation analysis released Wednesday. The results reveal that numerous government radiation stations showed beta radiation activity at four-month highs many multiples above background levels of the potentially dangerous particles. According to a Nuclear Regulatory Commission document obtained by EnviroReporter.com, the California Highway Patrol (CHP) considers any substance or environment exceeding three times background as a threshold for hazardous materials handling protocols. Sharp increases in beta radiation detected by the operable EPA beta monitors showed surges in the Pacific Northwest, Southwest, Middle West, South and along the Eastern Seaboard. Major metropolitan centers as well as more rural regional sites showed a strong upward trend while some places, including Los Angeles, actually show decreasing air radiation. Such a wide distribution at such high levels suggests that the source of the beta radiation could most likely be the ongoing triple meltdowns at Fukushima Dai-ichi Japan which began March 11, 2011. There is no other single source that could impact such a geographically wide area with that much beta radiation. That these rises seem to correspond to each other – all happening in the last week – is another indicator that they are related. While American nuclear reactors leak radiation accidentally and deliberately under government guidance, some of the radiation testing sites with significant upticks are nowhere near nuclear power plants. This may be the fickle finger of fission pointing at Fukushima. Massive amounts of alpha, beta and gamma radiation have escaped the complex threatening the Pacific Ocean and terrestrial bodies worldwide. Enormous amounts of radiation are also being made airborne in Japan by the government’s policy of burning much of the 23.8 million tons of rubble from Fukushima and neighboring prefectures in municipal incinerators the length and breadth of the island nation. The United States is downwind and down current of Fukushima and Japan. Evidence of Fukushima contamination impacting North America has been a major focus of EnviroReporter.com‘s Fukushima investigation. With over 6,000 radiation tests conducted since March 16, 2011, in concert with affiliated Radiation Stations, the experience needed to analyze this significant surge in beta radiation nationwide was already in place. Beta-emitting radionuclides include cesium-137, strontium-90, iodine-131 and tritium according to the EPA beta radiation website. Exposure to these isotopes can cause leukemia, blood and bone cancers and introduce DNA-destroying mutations into plants and animals. The latest EnviroReporter.com Nationwide Radiation Report analyzed the “beta gross count rate” of the 44 functioning beta stations among the 124 EPA RadNet monitoring sites across the country. 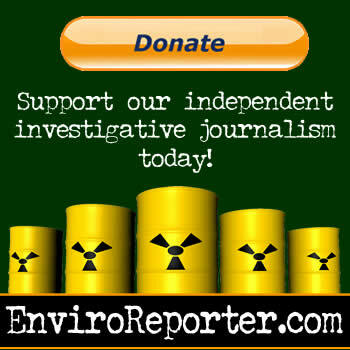 EnviroReporter.com began organizing the RadNet data into an easily accessible form July 9, 2013 in order to make this crucial radiation monitoring data accessible to the public, media and government agencies. Sixty beta stations were functional at that time. Determining when a site may be experiencing reading high beta radiation goes beyond the obvious jumps in readings on the graphs. Figuring out a location’s background beta isn’t always possible either, though with experience it can be done with approximated results. A level of 100 counts per minute (CPM) on nuclear radiation monitors like the ones EnviroReporter.com uses is a widely employed threshold indicating that there is significant, and possibly dangerous, amount of radiation. These kinds of detectors can detect alpha, beta and gamma radiation so the 100 CPM is the aggregate of these different emitter types. So does a 100 CPM count on an EPA RadNet beta graph also function as an imminent danger threshold? According to Coos Bay, Oregon resident Craig Daniels who submits readings to RadView.com, it may an inappropriate comparison. Daniels was correct. A danger threshold of 100 CPM on the beta graphs EPA RadNet maintains is actually conservative as it has solely beta measurements and doesn’t include gamma emissions. Beta radiation is far more dangerous to humans because of ingestion and inhalation factors that can lead to cell and DNA mutation and cancer. Therefore the ‘danger’ level for beta detections should be lower factoring in this biological fact. Regardless, by using the 100 CPM alarm level for RadNet’s beta graphs, it gives a relative sense of safety even if it should be a lower threshold. EnviroReporter.com uses both indicators of dangerously high beta radiation: triple background and/or readings above 100 CPM. This rather lengthy preceding explanation was in order to provide readers and viewers the proper context for this invaluable taxpayer-funded data. Record radiation highs were detected across the country from the Deep South north to Alaska, west from California to New England. Montgomery Alabama hit its highest reading since May 26 with a robust 250 CPM August 4. Fairbanks Alaska hit a four-month high with about 137 CPM August 4 which is a strong uptick for the station. Tuscon Arizona was over 310 CPM August 4 remaining quite active as was Little Rock Arkansas hit over 200 CPM in the last week trending upward in an area used to 20 CPM background. Ten times background is over triple the three times background danger threshold. Fresno California soared to 540 CPM August 1 and looks to be trending aggressively upward. Fresno’s normal background, when it used to have one, was between 40 to 50 CPM. Bakersfield California to the south 170 CPM August 5 while the Los Angeles beta graph’s stopped in March but the gamma remains normal.EnviroReporter.com‘s regular test for beta radiation in HEPA filter ionizer dust showed lower ionization August 5 for the west Los Angeles Basin. A test of Pacific waters off of the Los Angeles neighborhood of Playa Del Rey registered at background August 2 as did kelp collected and tested on the beach. 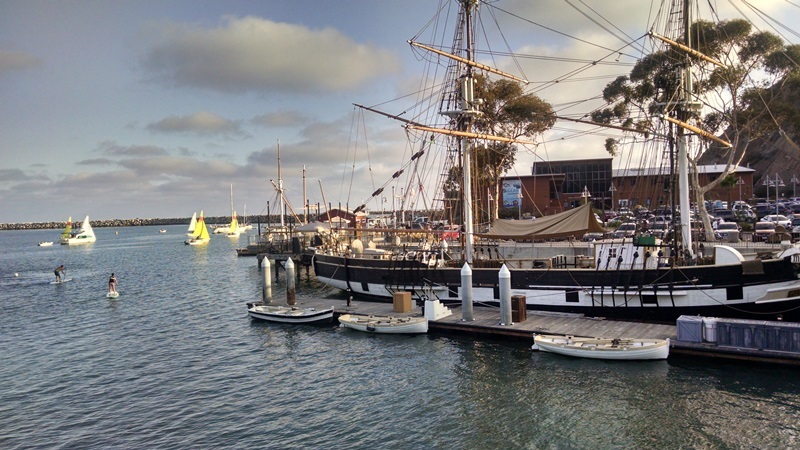 San Diego remained very active but off its highs of 220 CPM August 1 which is a dozen times background for the city. Why San Diego and not Anaheim and Los Angeles is experiencing this increasing beta radiation is unclear. An upcoming radiation investigation of San Diego could possibly explain the new highs. Hartford Connecticut was trending upward according to the report hitting a four-month high August 5 of 130 CPM which is over six times its normal background. Washington DC also notched a four-month high August 5 with 160 CPM. Ft. Wayne IN continued a radical trend upward hitting a four-month high August 4 of 450 CPM which is over a dozen times background. Worcester Massachusetts blew through 235 CPM July 28 and hit 152 CPM August 4 while Grand Rapids Michigan hit 345 CPM July 28 but settled to ‘just’ 200 CPM August 5. St. Paul Minnesota went up to 300 CPM in the last week. Lincoln Nebraska hit a four-month high August 3 with 360 CPM. Concord New Hampshire hit 220 CPM August 5 nearly tying a four-month high. Raleigh North Carolina hit 170 CPM July 24 and then the beta graph cut out. EnviroReporter.com‘s Radiation Station North Carolina recorded rain hot with beta radiation 6.9 times background July 21. Toledo Ohio beta radiation went through the roof right at the same time as their drinking water crisis eased with the beta peaking at 370 CPM August 5, a four-month high. Corvalis Oregon hit 145 CPM July 26 and kept going up hitting a four-month high August 4 with a whopping 235 CPM in a place that has a background of under 20 CPM. That is nearly two dozen times background and eight times the three-background hazard threshold. 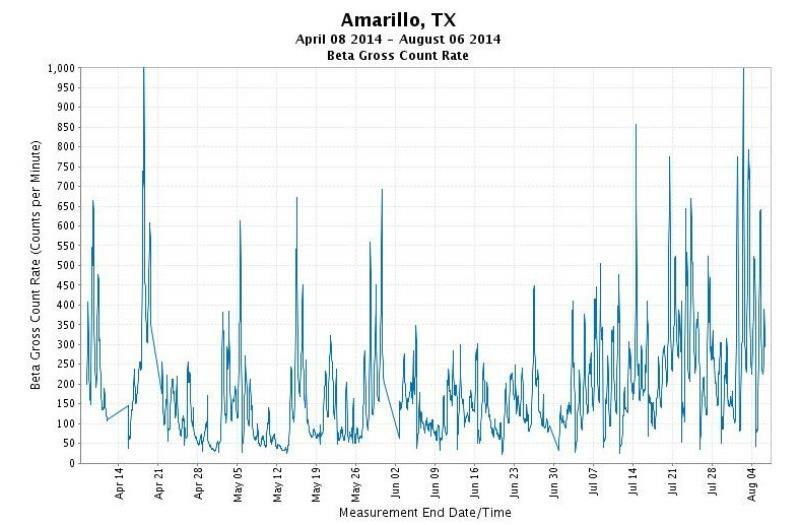 Amarillo Texas went literally off the chart August 3 blasting through 1,000 CPM. 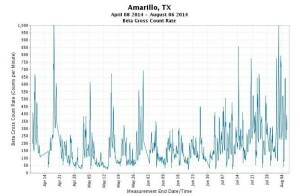 Amarillo consistently has had some of the highest radiation readings in the United States for at least the last thirteen months. Dallas was 270 CPM August 4 in the Lone Star State that has high reading across the breadth of it. But it is not alone. 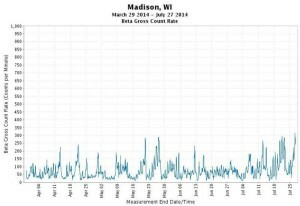 Madison Wisconsin hit a four-month high August 4 nearly topping 500 CPM. While these recent EPA RadNet readings are alarming, not knowing what is actually transpiring beta radiation-wise is a more troubling prospect. People in hot zones can mitigate against beta radiation in the air using ionizers with HEPA filters while indoors. Folks in areas not monitored are left wondering whether they should even be concerned. Considering the scope of the recent readings, the whole country might consider itself a potential hot zone. Have you done or completed the San Diego investigation yet? I was curious if you have published it. Thank you so much, we all appreciate what you guys and gals are doing! You might save the world! I am wondering if this could be the result of the Fukushima disaster ? Also it could be the result of the magnetic poles shifting and weakining . This would allow radiation to reach the surface of the earth. The only way to verify this is to check other countries around the world. @Courtney granillo: Radiation from Fukushima was found in blue fin tuna caught in San Diego just weeks after the meltdowns began. It’s only gotten much worse. Look at our Radiation Food Lab for the most comprehensive collection of food, drink and other material tests done in the U.S. and internationally. It will open your eyes to the extent of the radiological impacts on the food chain. Denise Anne and I test everything we eat but also consume smartly by removing the most obvious source of Fukushima contamination – anything fished out of the Pacific. Do you think it’s safe to eat fish from Hawaii or the California coast? downtown Plano , Illinois 08 CPM to 15 CPM . Target store , Yorkville Illinois 20 cpm to 25 cpm .All the readings are quite similar last few days . Thank you for all the extensive info. you share with us. I would urge your readers to do research into what are the effects of Radiation. What it does to the Genome, what Bio-accumulation means (including the fact that with each generation, symptoms will worsen). Children more radio-sensitive than adults, and so on. Please urge people to find sites that tell you how to use Bentonite clay in a bath or ingestion, baking soda/epsom salt baths, anti-oxidants – A.L.A. and Vitamin C in particular, M.S.M, foods high in potassium and so on. We can at least mitigate the effects of it, and we can mitigate the pain and suffering as well. That is something. Especially for those people with children and/or pets – the most vulnerable. Again, thank you for all you do. aug.29 2014 Mpls. Mn. 1.82 msph in rainwater today. I get readings like this routinely in my area, for the past three years. I have even had double that amount as well. Its not goin away. A couple of years ago, I borrowed a freinds geiger counter and took reading everyday for a couple of months. Seems when it rained and snowed the counts went up quite a bit.Do we know if rain contributed to the higher readings? Would you please let me know how you’re able to get these long-duration graph printouts? I’m not able to get any more than a week in graph form, any longer time period is rendered in rows of info. Tried all kinds of X, Y axes combos, etc. What am I missing? Thank you for your inspired reporting, this will be widely shared. @Another Simi Mom: Your eloquence is extraordinary. It gives us hope. Hope is one of the most valuable things in the world yet costs nothing other than fearlessness. You have all that. Thank you. Michael, I wanted to compliment on some of the clearest, most understandable-to-laymen writing you’ve ever done on the Fukushima airborne radiation issues. My continuing view of this situation is, as always, from an outraged view of the politics of dealing with public health effects of the Fukushima meltdowns in the United States. The fact that 79 of 143 beta monitoring stations are broken/not operating, despite the fact that those stations are owned and ostensibly operated/maintained by the United States Environmental Protection Agency, tells me that a very high-level public policy decision has been made to do nothing, and to say nothing, because a broad spectrum of high radionuclide readings around the country would make the present Executive Branch administration look ineffectual in the eyes of the voters, even if the Executive Branch has no power to dictate to the Japanese government and TEPCO what they must do and cannot do. The reality is that the Executive Branch does have the power and the knowledge to take some practical steps to mitigate and remediate negative public health effects of this nuclear fall-out in the United States is beyond inexcusable. The Executive Branch’s actions in this regard are Sovietesque in their brutality and indifference towards the health of young Americans. I wonder how many years it is going to take for these wildly-above-background CPM’s to be taken seriously by the “national press” and the Federal government’s public health agencies? Will we have to wait years until American children become very ill, in massive numbers, like the people born in southwest Russia, Belarus and Ukraine after April 1986? While there is perhaps nothing which can be done to stop the Fukushima radiation blowing on the United States, I wish that we were hearing a national discussion about what our society can be doing to mitigate and minimize the harmful effects of this radiation on our children and grandchildren, and their as yet unborn children. Native American philosophy holds that the current adult generation is responsible to protect the health and interests of the people going forward 7 generations. Our society and our government are not even looking forward to protect even 1 generation from the Fukushima fallout. The Soviets, and later the governments of the independent states of Russia, Belarus and Ukraine, hid their heads in the sand for far too long. Despite popular political myths from 1986-1987, the vast majority of children who lived downwind of the Chernobyl reactor did not receive “safe food and water” imported from far outside the zone of contamination. The bottom line with respect to both Chernobyl and Fukushima is that the connection between high levels atmospheric radiation, and on the ground radiation, will never be proven, to a scientific certainty, to have come from one nuclear plant or another, let alone to the satisfaction of the nuclear industry or its puppet politicans in the U.S. However, common sense dictates that from a public health point of view what the Federal government should be doing is widely publicizing ways to protect the health of America’s children and grandchildren, to-be-born and already born, and facilitating mediation and prevention, including by way of intense, continuous testing of air, water and soil around the country and in America’s children’s food and water supply. Instead America’s children and grandchildren are suffering, and will continue to suffer the consequences of Federal agencies obfuscation and silence on this issue. Negligent, incompetent, indifferent and callous. That’s our U.S. Environmental Protection Agency and Department of Energy, and their bosses, on the Fukushima radiation issue. The day has come where people concerned about their health and lives should be looking into how to remove toxic radiation from their bodies. Yes one or two high quality HEPA air cleaners will be a big help. This big spike in radiation is not good at all! People need to think about doing a radiation detox to remove the dangerous isotopes from their bodies! @Saul Meshach: That is one theory we think is definitely possible. @Craig Daniels: Thank you for the clarification. We’ve amended the article to correct the affiliation with RadViews. I don’t think that these sustained beta increases are attributable 99% of the time to radon daughters. Radon doesn’t behave in such a fashion and impact radiation reading more than one or two backgrounds in geologic areas producing copious amounts of radon daughters according to information we’ve studied. It is something more and the culprit, statistically speaking, is odds the most likely one: Fukushima. * I don’t operate RadViews, I only post to it –in anticipation of retiring my own web pages later this month. * “100cpm” only has meaning in the context of what’s being counted, with what kind of sensor and what the history has been for a given monitoring station. 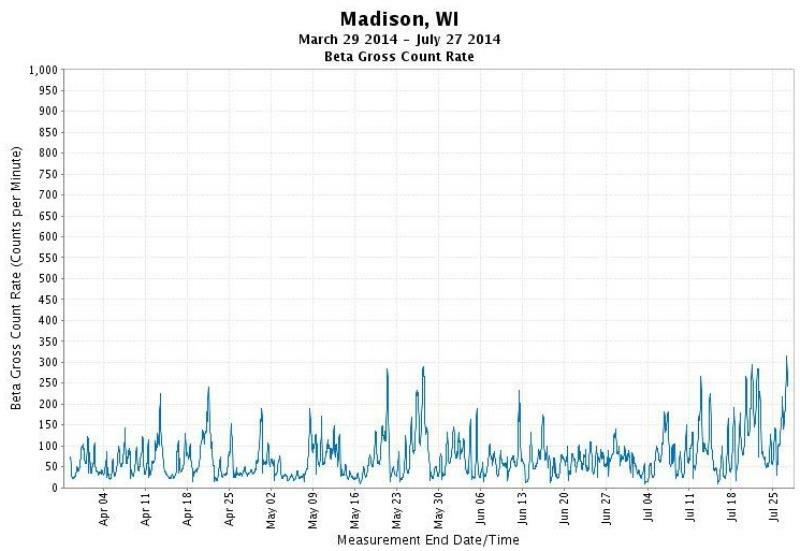 * EPA-RadNet stations use very sensitive devices to measure the beta radiation from concentrations of dust/air pollution in their filters, whereas amateurs who have a sensitive enough counter to set their alarm at “100” might simply park an affordable Geiger counter on a window sill –and we’re then mostly counting gamma. * I’ve long wondered at the comings and goings of beta counts, which seem to be 99% about radon daughters (at least for those of us using beta sensitive Geiger counters, air filtering and/or “wipes”). These counts can vary widely and they should concern us, with something like 20,000 radon induced lung cancer deaths per year–! That being said, it takes a dedicated radon detector in an interior residential space to come up with a meaningful number. I can’t relate any particular radon daughter CPM level (which decays by half after about 40 minutes) –even the CPMs from my own air filter runs, to some state or level of concern. There must be some type of new meltdown going on a Fukushima. A few weeks ago there were reports of unit 5 loosing cooling.